It is thin and can not be broken, it is easy to desorb, and it can be used repeatedly from morning to evening. I would like to repeat this. This review is about item#61017607. It is good because it is more durable than expected and can withstand multiple use. Especially the rubber part of the cuff. This review is about item#61017643. It was more durable than I thought it was a convenient and easy to use protective clothing for doing dirty tasks. This review is about item#61017625. It is disposable and regularly purchased. 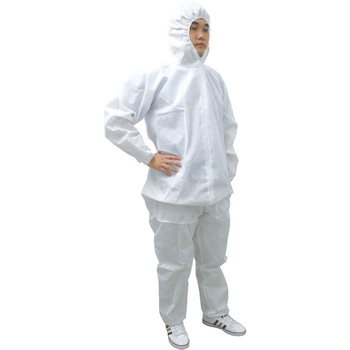 It is also ideal for dirty work in cold weather with insulation effect. I chose a bigger and worn. The whole length is just fine, but the torso part is long. Although it is just looks, there are no particular problems. I think that the cost performance is outstanding because it is durable for materials and can be worn many times without disposing. This review is about item#61017677. Because it is machine-oriented, work clothes are covered with oil, so it is easy to wear it from the top of work clothes with ease, so it is easy to work so it is very handy. Although it can not be helped for price priority, sewing is weak, and seams often get rained. This review is about item#61017616. Thanks for good price. One hot star is one star.